At CRS, we know that opportunities come in all shapes and sizes. And those opportunities can completely change an individual's—and a community's—life. About a dozen years ago, Catholic Relief Services was looking for a way to help the poorest of the poor financially. That may seem redundant—if you are poor, of course you need financial help—but it is one thing to help with nutrition or agriculture or water or health or even livelihoods, and another to help with finances. How do you make getting ahead financially a realistic possibility for someone who must run as fast as they can to stay in the same place economically, or who would find paying back even a small microfinance loan an unmanageable burden? Saving money and accumulating capital is the key, not just watching it disappear into the vastness of need. So, CRS came up with the SILC—Savings and Internal Lending Communities—program. 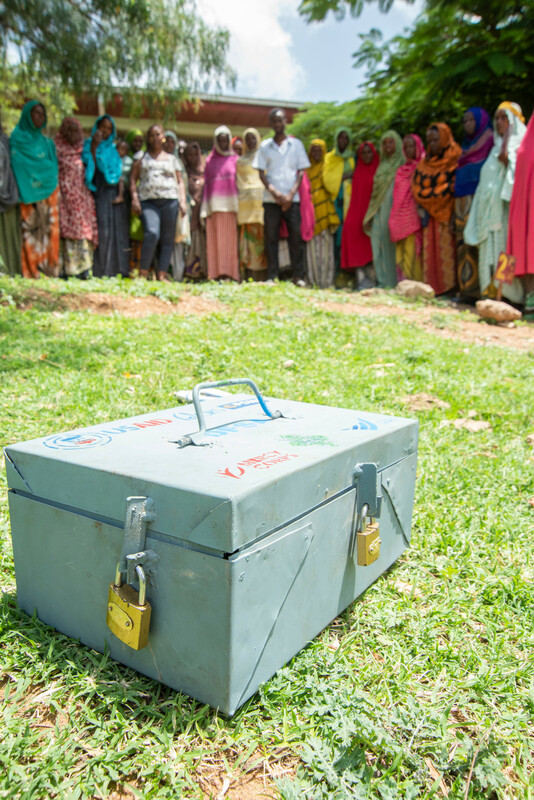 In villages around the world, the program begins when anywhere from 15 to 30 people form a community—almost all of them women—agreeing to put a certain amount of money every week into a box with three locks. The treasurer keeps the box. Three other group members are the key keepers. Unlocking the box at each meeting is an exercise in trust and cooperation. In addition to saving, the members can access the group’s assets by taking out a loan. The group decides on interest rates and payback schedules. At the end of a year, members get back the money they’ve saved plus a share of profits from the loan operation. CRS’ technical help usually ends at that point, but the members almost always continue on their own. It’s amazing to see what SILC members do when they have a little capital. Maybe they buy a few chickens and start selling eggs. Or purchase merchandise and open a small shop. Some use it to tide their families over during the lean season between harvests so husbands don’t have to travel to the city to look for work, disappearing for months. Others pay school fees for their children. Sometimes that something has nothing to do with saving money. SILC groups are often formed by various affinity groups—people with something in common. Maybe they are all affected by HIV or are victims of domestic violence. As they save money, they talk to each other, building bridges of trust as they provide support, advice and encouragement. SILC has now reached 3.3 million people in more than 130,000 groups in Africa, Latin America and Asia. Though it has existed for only a fraction of CRS’ 75 years, SILC grows from our deepest roots, from Catholic social teaching. The SILC program is a prime example of subsidiarity, solving a problem on a local level. It promotes solidarity among its participants, people who otherwise might never join together. And, most importantly, it fosters integral human development as its participants grow materially, psychologically and spiritually. 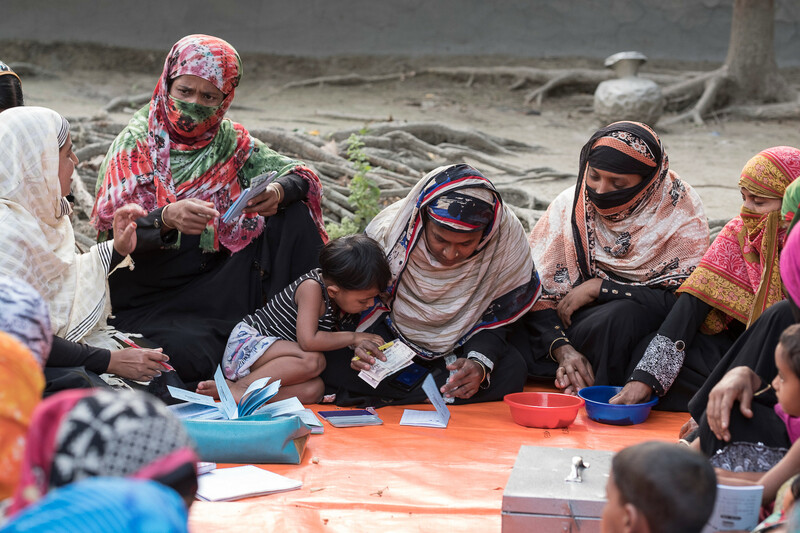 When those three keys unlock a SILC money box, they open up something fundamental to our mission—a recognition of the dignity that God has given each and every one of us. Learn more about CRS’ savings-led microfinance programs. Find out how we work with children and their families to restore lost childhoods and end child trafficking in India. Plus, we introduce you to a young woman who, forced to flee her home, started over with help from an unlikely source—coffee school. In a simple schoolhouse in a rural Ethiopian village, Zeineba Wado Markato eagerly raises her hand. She stands and recites the capitals of African countries. Her classmates clap in response. Zeineba, who is in seventh grade, didn’t used to be so confident. She was afraid to answer questions in front of her peers, especially boys. But now she’s receiving tutoring, which has boosted her self-esteem. And, she is seeing results. Her grade has improved from a 75% to an 89%. 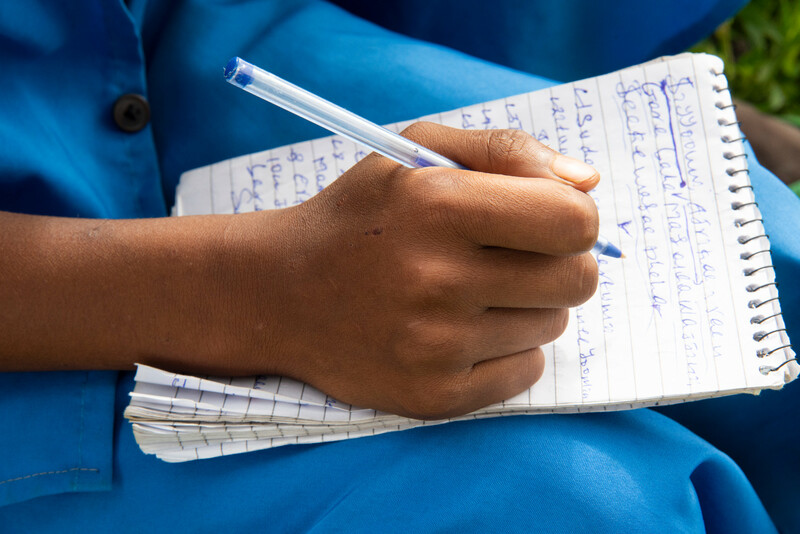 Education is not a given for girls in villages like Zeineba’s. Families often invest their limited resources in boys’ schooling. Girls are expected to care for their families and perform household chores like collecting water. They also face harmful traditional practices, like early marriage. Some girls marry as young as 12. Catholic Relief Services is working with the Church and local partners to provide girls like Zeineba opportunities to break through these barriers and reach their full potential. We’re helping them stay in school by providing tutoring support and covering school fees. We’re also engaging community leaders to change attitudes and promote gender equality. For girls who have left school, we organize savings groups and trainings to help them invest in small businesses. After her morning classes, Zeineba leads a gender club meeting. A group of about 15 students, both girls and boys, gather in the grass outside the school. The club is a support system. Members discuss challenges girls face and increase boys’ understanding. They follow up with girls who have dropped out of school and help raise awareness about girls’ rights in their families and community—including dividing the burden of household work. “I help my mother by fetching water, making coffee and collecting firewood,” one boy says proudly. The group also talks about menstrual hygiene. 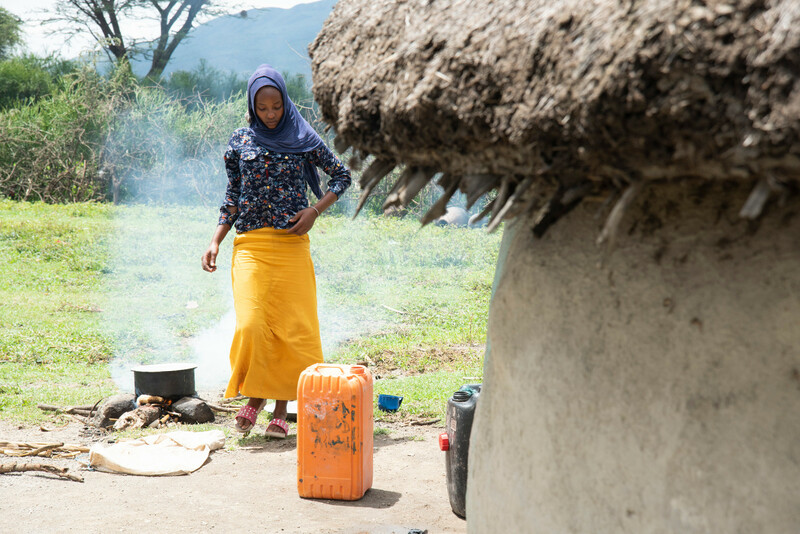 Schools in rural Ethiopia rarely have separate restrooms for girls or adequate hygiene supplies, making it difficult for girls to attend school during their menstrual cycle. We’re helping girls stay in school by constructing latrines with separate facilities and providing sanitation materials. Now Zeineba doesn’t have to miss 3 or 4 days of learning each month. When Zeineba gets home from school, she quickly changes out of her bright blue school uniform. She then prepares a meal of barley soup for her family. Her parents are proud of her success. Zeineba’s mother got married when she was 15 and never went to school. Four of Zeineba’s sisters got married before completing their education. Their mother regrets this. For Zeineba, it will be different. “Zeineba’s future is bright,” her mother says. She wants her to attend university and find a good job. That’s Zeineba’s plan. She wants to be a doctor. “If you go to a health clinic, women and girls are the most vulnerable, so I want to treat them,” she says. Zeineba’s father says she is already setting an example for her neighbors and her two younger sisters. He hopes she can help change her community, and her country. “I’m teaching my sisters to follow in my footsteps,” Zeineba says. Education is a right for all children and opens doors. 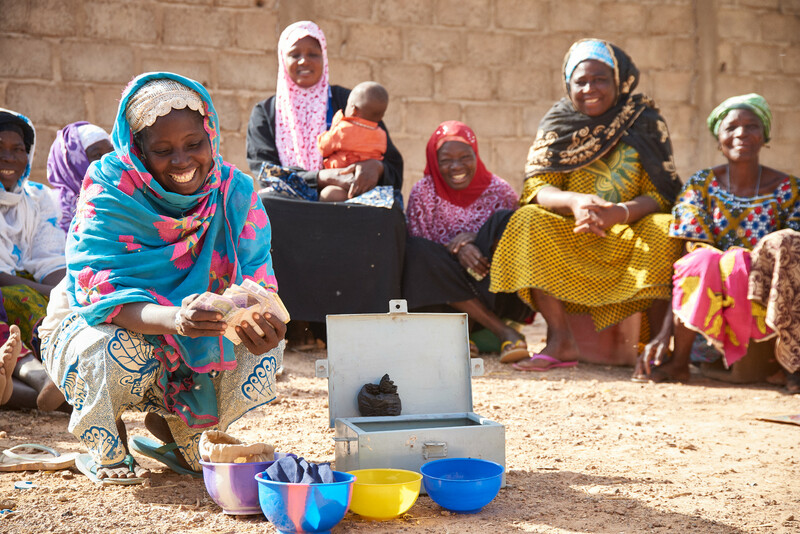 Beginning in the 1940s with school nutrition projects across West Africa, CRS’ education programming has grown to 76 projects across 38 countries worldwide. As we mark this 75th year, we celebrate the dreams and opportunities of girls like Zeineba. Every day, CRS works with some of the most vulnerable children on Earth. Hear how they inspire us with their courage and resilience during the most difficult situations. Discover the world and help touch the lives of more than 120 million people in more than 100 countries. Show your love of CRS on Facebook, Twitter and LinkedIn. It takes more than one person to create change. Use your time and talent to make a difference. Help us help others. There’s so much goodness in the world and you are a part of it. Let your spirit shine by lighting a virtual candle. Get involved in issues that are impacting the people we serve around the world. Empower. Educate. Rebuild. When you support CRS, you support change.